No, that isn’t bad grammar for meeting friends at White Wolf games – although my loyal group of players at my World of Darkness games are pretty cool. 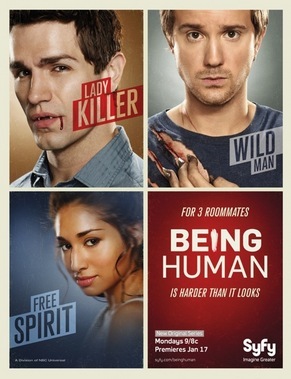 Actually it’s the impression I have of some new show on the annoyingly misspelled “SyFy” channel called “Being Human”, after seeing their ad in the Vanity Fair that arrived today. Based on this ad, I also really hope that is actually a send up of all the “must cash in on TWILIGHT and TRUE BLOOD! NOW NOW NOW!” shows out there at the moment, instead of being exactly that. The ad certainly is trying hard to have a sense of humor. The profile pictures of the characters looks like a blatant rip off of those ubiquitous Dexter ads, with the very distinctive lighting effects and typeface. And then there is their visual introduction to the characters, which utilizes pretty much every horrible supernatural pun and clichéd stereotype they could possibly fit on one page. The vampire’s drink is Bloody Marys? The werewolf listens to thrash metal? The ghost listens to SOUL MUSIC? Seriously Syfy? This is the best you could come up with? It’s like a supernatural version of that State sketch about the Jew, the Italian, and the Redheaded Gay, except without the witty jokes and sarcasm. Obviously, the era of the SciFi channel that aired such amazing shows as Battlestar Galactica has died and been gleefully buried by the era of the SyFy channel and the reign of Sharktopus. “Lady Killer”? AHHH!!! The horrible clichés are certainly killing me. Well, from what I’ve heard here and there, Sci-fi was pretty tough on BSG, too – mandated the crappy ‘one plot / episode’ slowdown midway through, didn’t approve a fifth season, etc. Of course, who knows what’s true and what’s rumour..